// JSR-330 API not available - Provider interface simply not supported then. The standard Java libraries fail to provide enough methods for manipulation of its core classes. Apache Commons Lang provides these extra methods. 提供bean的创建 (有construct方法), 属性注值, 绑定 (包括自动绑定)和初始化. 最主要的子类要实现的模板方法是 AutowireCapableBeanFactory.resolveDependency(DependencyDescriptor, String, Set, TypeConverter), 这个方法用来实现类型的自动绑定. Check if this bean factory contains a bean definition with the given name. Find a Annotation of annotationType on the specified bean, traversing its interfaces and super classes if no annotation can be found on the given class itself. Return the number of beans defined in the factory. Return the names of all beans defined in this factory. Return the names of beans matching the given type (including subclasses), judging from either bean definitions or the value of getObjectType in the case of FactoryBeans. Return the bean instances that match the given object type (including subclasses), judging from either bean definitions or the value of getObjectType in the case of FactoryBeans. Find all beans whose Class has the supplied Annotation type. Freeze all bean definitions, signalling that the registered bean definitions will not be modified or post-processed any further. Return the registered BeanDefinition for the specified bean, allowing access to its property values and constructor argument value (which can be modified during bean factory post-processing). 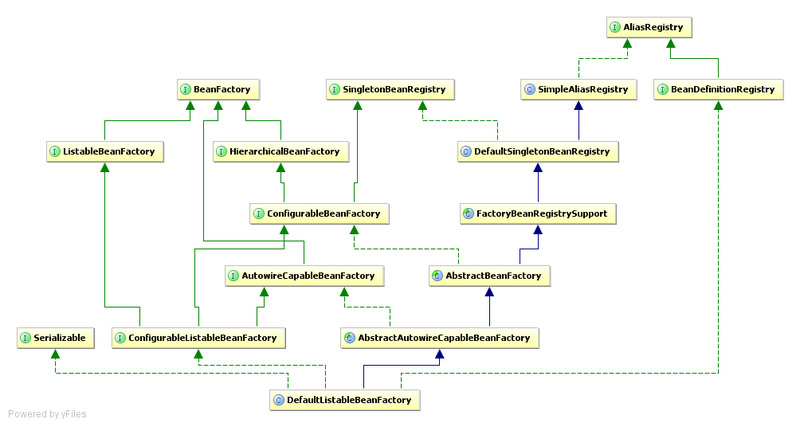 Ignore the given dependency interface for autowiring. Ignore the given dependency type for autowiring: for example, String. Determine whether the specified bean qualifies as an autowire candidate, to be injected into other beans which declare a dependency of matching type. Return whether this factory's bean definitions are frozen, i.e. Ensure that all non-lazy-init singletons are instantiated, also considering FactoryBeans. Register a special dependency type with corresponding autowired value. Check if this registry contains a bean definition with the given name. Return the BeanDefinition for the given bean name. Return the number of beans defined in the registry. Return the names of all beans defined in this registry. Determine whether the given bean name is already in use within this registry, i.e. Register a new bean definition with this registry. Remove the BeanDefinition for the given name.